Hello lovelies! Today, I'm sharing with you all one of my top advertisers this month, Rachael, from All The Little Things. Rachael's blog is fairly new, but she's off to a flying start with recent posts including a Halloween themed Pumpkin Carving post, an Urban Decay Haul and much more! To introduce you to the blogger behind the blog, I asked Rachael a few questions, so, I hope you enjoy reading! I started my blog at the end of August 2013 after months of reading other blogs. I had them all bookmarked on my Nexus7. After a trip to Chester Zoo while on holiday with my lovely boyfriend Gary he said to me about sharing some of my photos online in a blog because they were good. i love my photos and he thought others would too as i sometimes tend to capture pictures that are in that once in a life time category. I thought about it and thought about it and finally one day I kick started my blog. I didn't know what i would name it nor did i know what i was doing but Gary helped me decide and All The Little Things x was born and now it is a staple in my every day life. Simply the name is because I have been through some very tough times in the last two years and i am always talking about how all the little things in life matter. i really love sharing my thoughts and photos and reading other peoples views and opinions. I love being able to share my view and getting my point across in different ways. Being the only girl from a family of three boys and my mummy and daddy its not always been easy to do that but its getting easier. It is great to know people like to read your opinions and respond with their comments. It really does make my day seeing a new comment waiting for me. 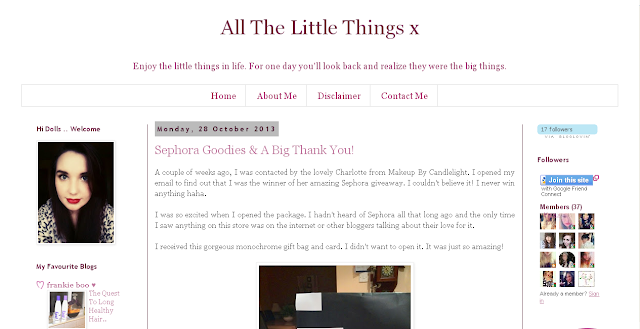 Blogging has actually helped me to believe in myself a bit more and has helped me with my confidence struggles. shopping habits definitely! Although i find that my spending has calmed down a bit i find that i am trying things i never would have normally tried and i have a list the length of my arm of things i want to try. I have been in contact with some lovely people, leaving comments etc (including you of course Chloe) and it means a lot that people take the time to leave lovely comments. Hopefully i will make some new friends out of the blogging community. i get my inspiration from other blogs that i read. I check my dashboard a few times a day and see some amazing posts wrote by amazing people. It means a lot that people see that you have wrote something that matters to them in some way. i also get inspiration from my family and Gary. Without them i don't know where i would be. What is your staple fashion item for A/W 2013? What is your go to A/W beauty look? Since starting to work for Lancome, i have become a bit more adventurous when it comes to make up. I love paying close attention to my eye make up with berry colours, bronzes, green and greys. Also i have got more adventurous and love a good bold lippie but some days care for that tinted lip balm for the more natural look. unfortunately my social media life 9nly goes as far as my blog and that is how i love it. If you want to get in touch with me or ask something that's where you will find me. I don't like Facebook and i wouldn't use twitter. My blog, google+ and email are as far as i go. But to be honest i really love it that way! Rachael is one of my 'Large Ad Package' advertisers, for more information on Ad packages and if you'd like to advertise on Chloe's Way, check out my page here, for more info. Currently on 50% SALE until 1st November! Such a lovely interview :) great job!